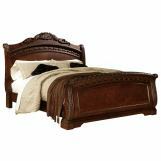 California King: 86" W x 102" D x 91"
King: King : 87" W x 105" D x 91"
This North Shore Canopy Bed combines traditional style with modern sophistication. 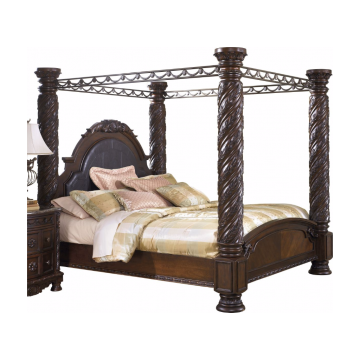 Featuring an upholstered headboard and grand spiral columns that frame an elegant canopy, this bed transforms any space into a rich and luxurious environment. 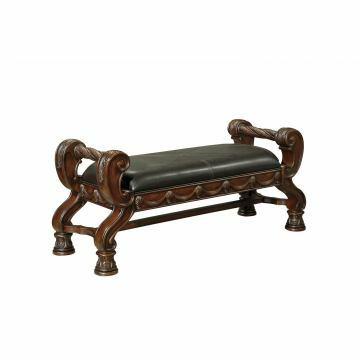 Repose in the lap of luxury with the North Shore Collection by Millenium. is this bed very solid when put together? We are thinking of putting it in our B&B but concerned about noise if not super tight. Best Answer: It is very solid and weighs almost 1000lbs. Can you buy replacement side rails for this bed to make the bed into a regular king vice a California king? Best Answer: Yes, the rail can be purchased separately and the bed can be used as a regular king. Do you have the North Shore or the South Coast (bisque color) in a queen size? I found a private owner who had a queen, but it was sold already. 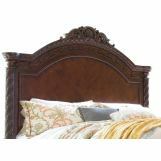 Best Answer: As far as we know this bed was never available in Queen size. 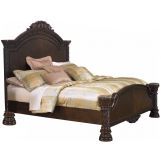 can I purchase this bed in a queen? how tall is the north shore canopy? Does the headboard have real leather? 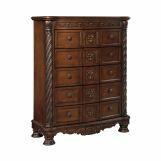 Best Answer: Thanks you for your interest in the Ashley Furniture industries North Shore collection. 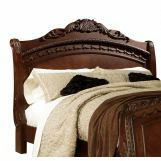 The headboard in the bed collection is made from a durable and attractive polyurethane material that meets and exceeds industry standards for wear and durability. 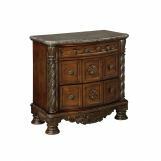 Do the drawers have a dovetail finish? Best Answer: Yes, the drawers feature dovetails. How tall are the post on this bed? 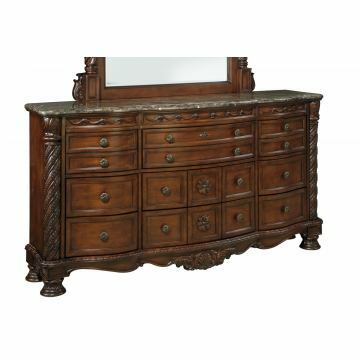 Will it fit in a standard master bedroom I currently have a king size bed is the width of headboard and footboard exceed normal king size sets? Best Answer: Hi Shenae, the posts are 91" high. This bed is quite big and looks best in a room that is at least 14' x 12'. 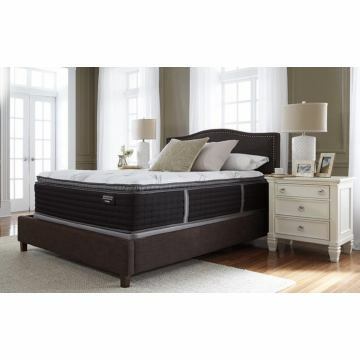 The king size bed works with a standard size king mattress and sheets. Sara does the room for bed alone need to be this big or can I get the nightstand and dresser in the room too? My bedroom is 13x11. 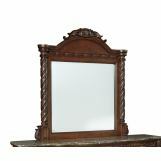 I have the Ashley bed B553 in light wash. Is the armoire, dresser, and mirror still available in this color ? can this set be bought with out the bed? Best Answer: Yes it can. Please call sales at 212-518-2752.
what are the measurments of this bed? 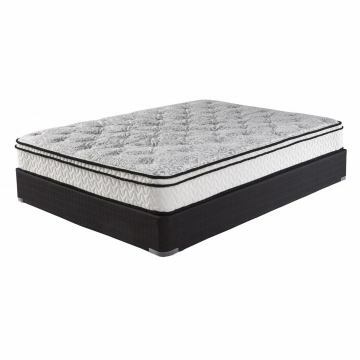 Can you use an adjustable bed base with this bed? What is the dimension of the canopy style king size bed frame? Best Answer: There is no tan color for North Shore. How do I assembly bed? Best Answer: BEd comes with assembly instructions. We also have set up in one of our delivery packages. Please call in for more info. Is it possible to purchase the bed posts separately to connect the bed without purchasing the canopy? Best Answer: It is not possible on our site. does the canopy bed fit into standard ceiling height rooms? Best Answer: Highest point is 91"
do u guys ship to the Bahamas? Best Answer: We do not ship to Bahamas directly but there are many shipping companies in South FL that can help you. Our clients from Bahamas usually just have us ship to one of the delivery companies. Can you tell me what the average weight for the bed, dresser/mirror, nightstand would be? how much for the bed only ? How can u tell if the dresser is real marble? Best Answer: Yes, the dresser is real marble. Do you have the off white color? Is this one that you're selling the Ashley's Furniture name brand? 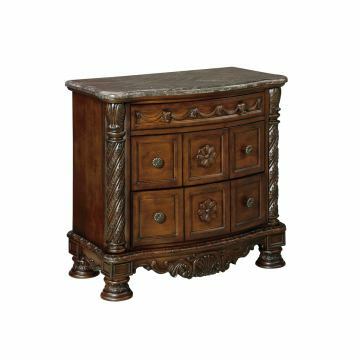 I currently have this bedroom set, but was thinking about removing the rails and the two posts at the foot of the bed. Can I do this and cap the footboard with the existing caps from the posts? Best Answer: Hello, unfortunately the bed was not designed to be able to be set up without the 2 front posts.